Knowing what your current and potential customers are looking for can give you the competitive edge to make your company stand out, and it’s easy to accomplish without conducting years of complicated – and costly – market research. Sometimes the best way to get answers is simply to ask questions. But although online survey tools have streamlined the process of collecting information, designing a good survey that provides useful, consistent data can be more complicated than it seems. Emphasize Design makes your Calgary web design the hub of all your marketing efforts. A good survey requires a clear purpose and carefully constructed questions. Done well, it can help your business to focus and develop areas that need to be stronger. Why are you making this survey? How will the data affect your business plans? How are you going to format your questions? If you want to be able to create charts, you will need questions with numerical values for answers. If you want quotes from clients, you will need to include open-ended responses that allow people to voice their opinions. How will you use the data? If you plan to use the information in an annual report, consider asking the same questions you have asked before, so you can effectively compare data with the results from last year. While writing, you will want input from others in your company and the experts on your Calgary web design team. Send out a draft to all departments involved with a response date. When you allow others to help write the questions, they are more likely to accept the answers…even if they mean change! Use closed-ended questions that require a choice from a list of answers when possible. This will greatly simplify analysis. Yes/no, true/false, numerical choices, rating scales all provide clear cut data. Remember your company’s first website? It probably went through several versions before it got to its current state. Much like great Calgary web design, a survey must be tested and revised to make sure it’s meeting your original purpose. Keep things logical by paying attention to the flow of questions. Your survey should open with an introduction to motivate your respondents, begin with your more general questions, and narrow in scope as you finish. Your survey needs to be as short as possible. If it takes longer than 5 or 10 minutes (usually about 40 questions), people will abandon it. 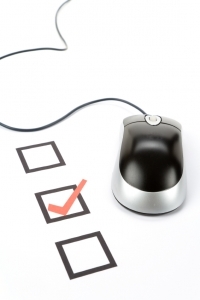 If a question doesn’t meet the specific goals of this survey, save it for later. Consider offering an incentive (prize, discount code, etc.) for taking the survey. Test drafts on people outside the process. Those too close to the survey will breeze right past questions loaded with complicated or confusing language. Pre-testing your survey will also help you learn how long your survey takes. As a marketing tool, a survey can help you gauge interest in new products and evaluate customer satisfaction. At Emphasize Design, we understand the importance of involving our clients in the process of improving their business. PreviousPrevious post:Best Branding Practices: Emphasize Website DesignNextNext post:Emphasize Website Design: What Happens When you Search?